Missionaries Don and Mary Wolfram hold seminary classes in the Amazon jungles of Ecuador. 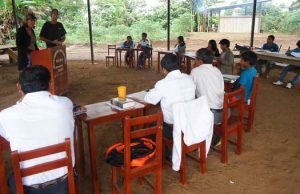 “Most students are jungle tribal people with no opportunities to attend a seminary level Bible school,” says Don. “They are a diverse group: young(14) to old (70), illiterate to literate, schooled and unschooled, new believers, veteran Christians and even non-believers, Jungle Indians to Spaniard descendants and many others. We initially had a sophisticated, western-style application, but threw it out when God convicted me and confirmed that He was the one that would send the students, and that each and every one, regardless of appearance, age or credentials, deserved an opportunity.